Sorry for the delay, it was already crazy around my place between giveaways and Monsters and my Etsy shop and all the wonderful reviews I've been sent. Then on Thursday night I broke my foot. Long story short, I stepped on my cat's tail and when I tried to get off quickly I landed wrong and my girlfriend heard it snap from the complete opposite end of the apartment. I am healing and am stuck home for a while but at least I can type right? Everything is taking longer because I can't get up and get things I need when I'm alone so reviews and the shop and everything were put on hold. Anyway.... Today I have a great review for you of some nail art items I received for review from Born Pretty Store. I was contacted by their rep about reviewing some items and since I've used their supplies before and have always loved them in the past I was glad to grab at a chance to review something. 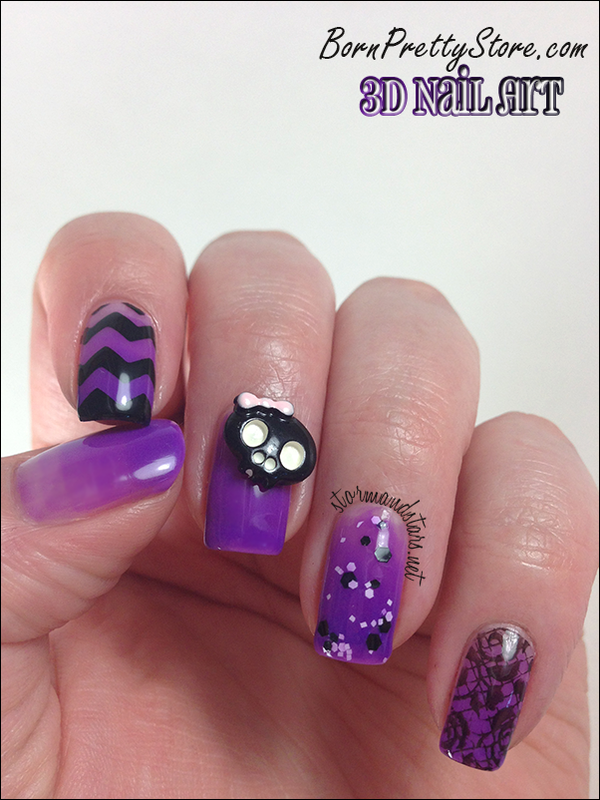 The items I chose are 3D Nail Art items which can be added to designs or even a plan manicure to give them some flair. I'll show you the manicure first and then I'll show you what I got from Born Pretty Store. I started with a base of a Jelly Syrup mani using Messy Jessi Monsoon Season then added different items and designs to each nail to make a skittles mani. Here she is! I really love how these came out. The 3D skull on my middle finger is the review item from Born Pretty Store. It came with a bunch of other in this great little wheel. As you can see there are two of each Nail Art item to use. I only used one because I didn't do a whole manicure. Unfortunately I didn't realize the 2nd one is face down until after I took this photo, but here is a photo of just the wheel with it right side up. I probably tried 3 or 4 of these before deciding I liked the black skull the best. But you can see I could have gone with quite a few of them. 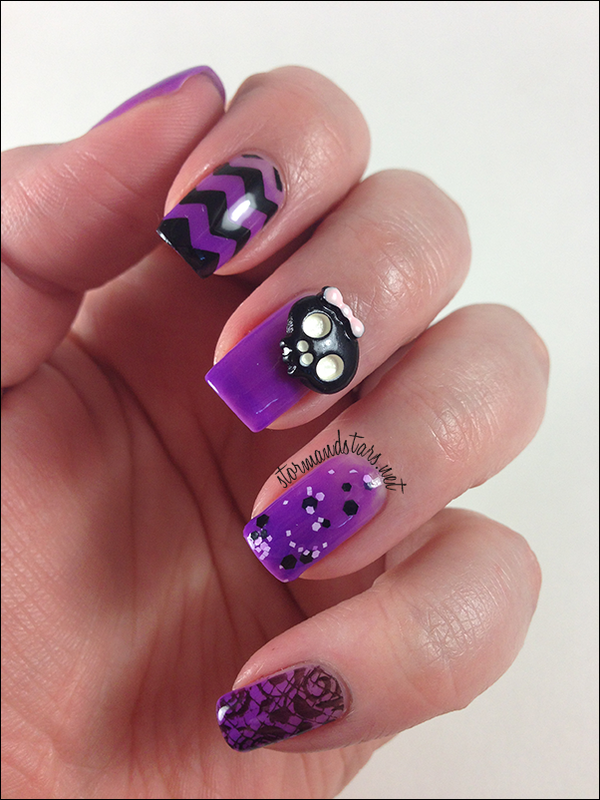 Shall we take another look at this mani? I used tape cut with pinking shears and Milani Black Swift to make the chevrons on my pointer and Messy Jessi Chance of Thunderstorms on my ring finger nail. Finally I used PWEEN27 to stamp with Milani Black Swift on my pinkie. I love this plate, will definitely use it again. 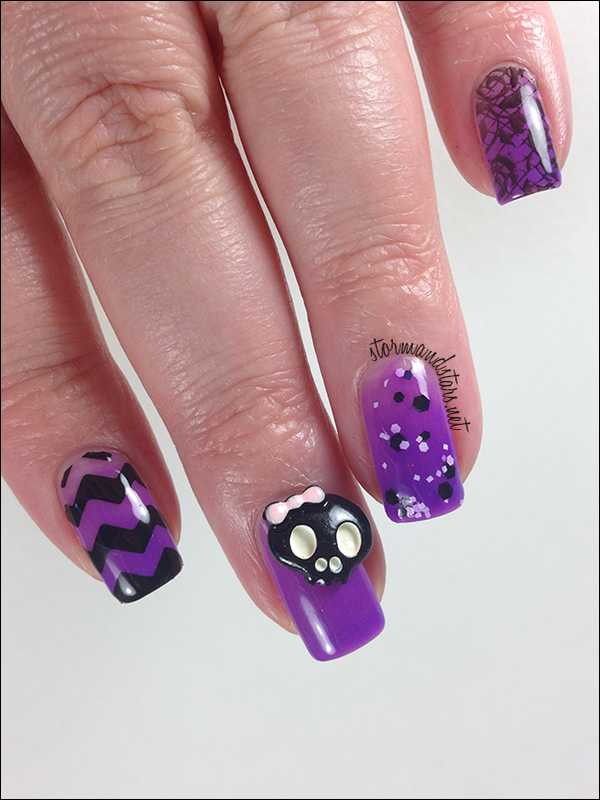 I want to add that after I was done with this manicure I was able to remove the skull Nail Art and put it away without any damage so I can use it again! 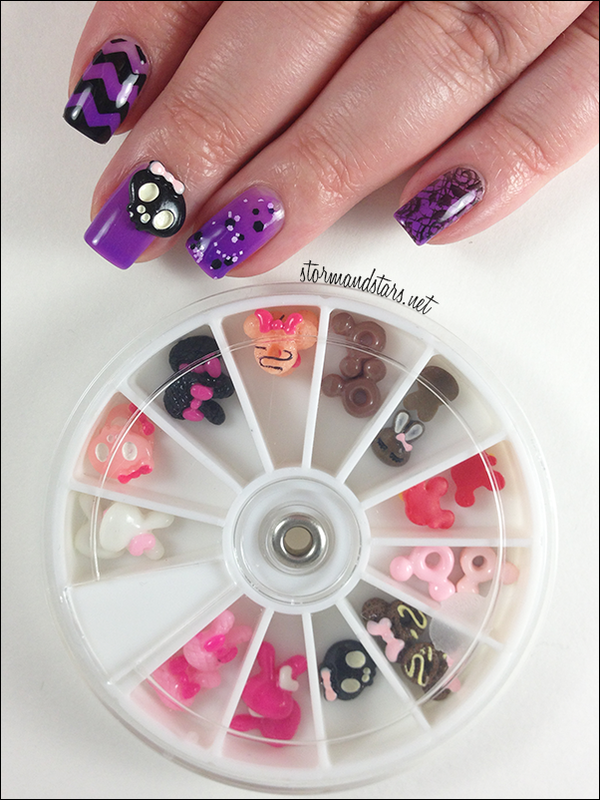 I'm sure I'll be going back to this wheel for other manicures. I'm really looking forward to using the bunny 3D pieces. 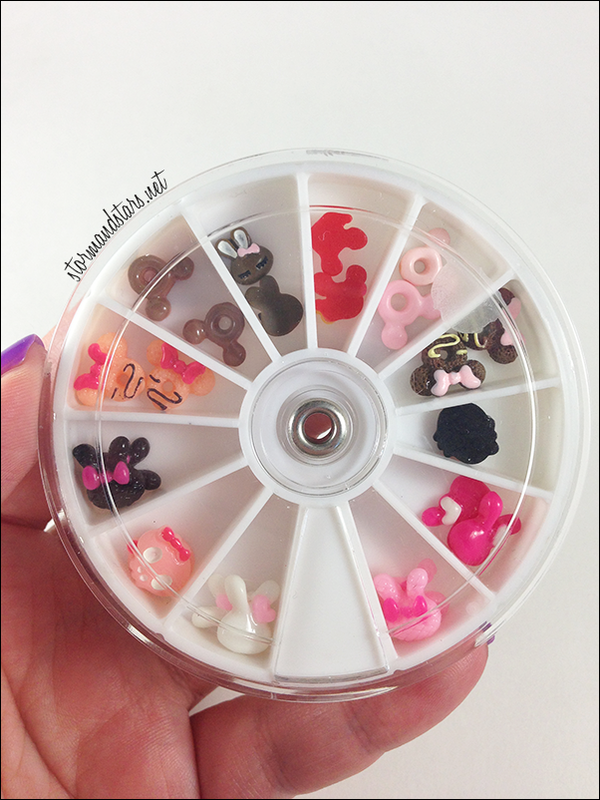 What do you think of the 3D Nail Art items from Born Pretty Store? As an added bonus, Born Pretty Store has given me a coupon code for you all to use and get 10% off your entire order with them. Just enter code AGBQ10 at checkout. If at least 10 people use the code Born Pretty Store will sponsor either a giveaway or contest here on my blog for you all! 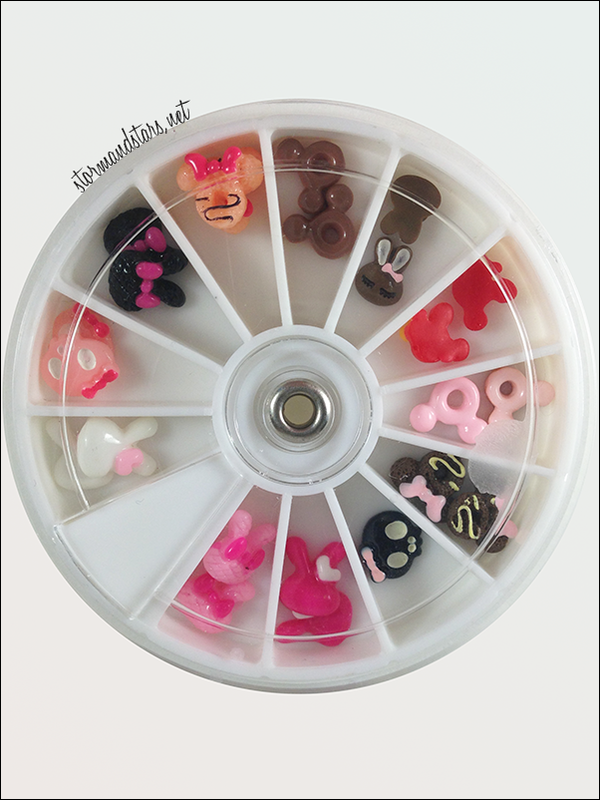 This 3D Nail Art Wheel retails for $4.27 and can be purchased here.